Life was not easy for 65 year old Mahipal Ram of Harra Dipa village in Jashpur District of Chhattisgarh. His legs are weak because of which he cannot walk. He is also blind in both his eyes. Mahipal had been living with his 62 year old wife Panmati Bai in a kutcha house. The family was living in poverty and Mahipal’s disability and had made life more difficult for them. But this year, the couple saw a ray of hope through the convergence of various schemes of the Chhattisgarh government. In fact all of the needs of this family have been fulfilled by the administration. Mahipal could not move and because of this he could not earn. He and his wife had often faced trouble meeting the regular need of food. Sometimes they had to starve. But now their food safety has been ensured by the ration card issued to them under the Khadyan Yojana. The kutcha house they were living in was also in a pathetic condition and it could not protect them from rain. However, they have got a new pucca house constructed under the Pradhan Mantri Awas Yojana. The family is safe under a new roof and do not have to worry about rainy days anymore. They have also got toilet and other facilities constructed under various schemes. Both Mahipal and Panmati are now getting old age pension of 700 rupees each. Under the Ujjala Yojana, they have got a cooking gas connection too. Mahipal has also been provided with a tricycle to help him move. He now moves without difficulty with the help of the tricycle. “We are now getting food, shelter, pension and everything else. All our needs are being fulfilled. Usually parents take care of their kids but our needs are being taken care of by the government. I can only bless them for this. I had never thought that I would shift directly to a pucca house from my kutcha hut. I had never imagined that my problems would be solved like this.” Says Mahipal. The facilities Mahipal and his wife are getting through the convergence of various schemes have totally changed their lives. From a life of vulnerability and insecurity, the couple have been lifted to a safe and comfortable life. Now that their primary needs are fulfilled, they feel relieved. 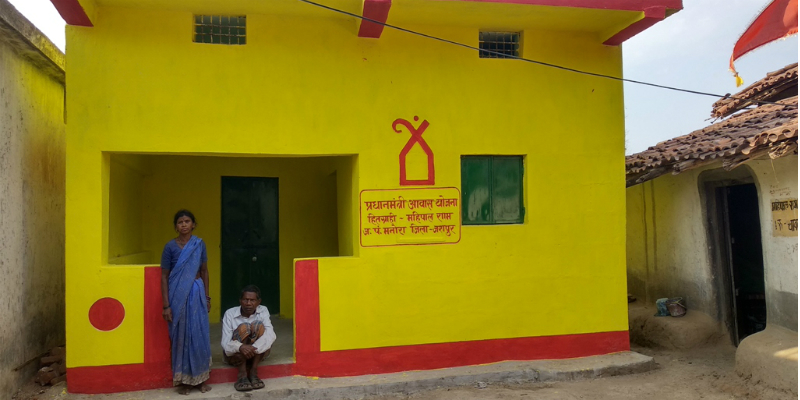 Mahipal’s family is an example of how various schemes of the government have been utilised to make life easier for underprivileged people in Chhattisgarh. A lot of families like Mahipal’s in the state have benefited from these schemes. These people are from various walks of life and have been leading a life of comfort without having to worry about their basic needs. The Chhattisgarh government has been putting a lot of emphasis on alleviation of poverty, social security, food safety and livelihood. Convergence of various schemes to meet the common objectives of improving the lives of the people have been a significant part of this vision. People like Mahipal and Panmati are examples of such efforts.